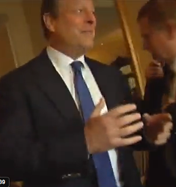 Al Gore, what's your reaction to Arctic ice increasing? Jesse Watters from Fox News confronts Al Gore and asks why he will not come on the O'Reilly Factor. When Al Gore tries to walk away without answering, Jesse Watters follows him and asks what he has to say about the Arctic ice increasing, if he's embarrased about Climategate, and if he will make money from cap-and-trade legislation, to which Al Gore replies that he is going to lunch. Thank god for Fox news, how else would we know how truly sleazy the Republicans are. Enjoy you disappointing gains this fall followed by being demolished in 2014. You guys really have no clue whats up. The baby boomers aren't in charge anymore.